Buchung von privatem Autoverleih mit Fahrer, für alle Reisen vom Flughafen Charles de Gaulle und dem Flughafen Orly nach Paris, Hotel oder Appartement. Der Chauffeur begrüßt Sie im Ankunftsterminal mit einem Schild mit Ihrem Namen, Unternehmenslogo oder einem anderen unverwechselbaren Schild. Er meldet sich mit einer Textnachricht bei Ihnen für seine Ankunft. Die Fahrer sprechen Englisch und sind Profis mit einer Lizenz vom Transport Dienst. The driver met us at the assigned spot, helped with luggage and was very courteous and friendly. The car was clean and very comfortable. We will definitely use him again. Despite our flight delay and long wait for checked baggage, our driver was waiting outside baggage claim with our name in a card. What a relief! Short walk to parking, help with our baggage, even bottled water waiting. Forget about train transfers, the crowded subway, a car waiting upon your arrival is the only way to go. Our driver Sayah was fantastic! In addition to the professional and courtious service, he was excellent about important sights, restaurant recommendation, places to be mindful of and quite frankly great conversation. He’s great! I certainly recommend!! Sayah Baaroun was the BEST driver any one could be lucky enough to book! He was articulate, was prompt, was stylishedly dressed......car immaculate, and the best part......he knew and pointed out the sites of Paris we would not have seen........We booked only a round trip from CDG airport, but liked him so much.......we used him the entire week.........and have already recommended friends here in Palm Springs, California to use him the end of September as they will be going to Paris at that time. Lucky us to have found Sarah on Vivator!!!!! Absolutely excellent and worth every cent. We exited with our bags after customs and immigration and the driver was there holding a sign with our name on it. He provided interesting information about the places we passed, explained how he peripherique ring road around the city works and took us directly to the door of our hotel in the Latin Quarter. We flew overnight from the US and not having to deal with anything except getting into the lovely car was wonderful! Cannot say enough about this service and our driver wish I wrote down his name. After a long flight from the Western US to Paris we were delayed almost two hours going through Customs. The driver waited for us and was extremely pleasant despite the long delay. 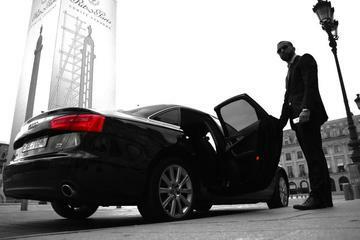 The car was immaculate and the driver was excellent navigating out of the Paris airport and traffic into the city. The conversation was delightful along the way and it was the most pleasant ride to our hotel after the long flight. Highly recommend this service! On time, professional and kind. What more could you want??? On time, professional and gave a great tour into the city!!! Phillipe was such a lovely person, and we had a great conversation with him on the drive into Paris. He gave us his personal top five things to do, and we made sure to see them! The driver even walked me inside to my airline!